There is a garden in which the earth was of pieces of fine gold, and it was sown with corn of gold, stalks as well as leaves and ears . . . more than twenty golden sheep with their lambs, and shepherds, who guarded them, their staffs and slings, were made of this metal. What Cieza de Leon did not realize is that these “golden sheep” were not sheep at all (sheep were introduced to South America through Spanish imperialism), but rather the most important animal within the Inca Empire: the llama. Domesticated 6,000 to 7,000 years ago in the dry puna grasslands of Argentina, Chile, and southern Peru, llamas provided an important source of meat and of fiber used for manufacturing rope and bags in several early Andean communities. Andean artisans shaped and repurposed llama bones as tools and weaving supplies, while llama dung provided a source of fuel to heat homes. Llamas also allowed disparate cultures to interact and create trading networks by serving as the primary beasts of burden within the Andes region. Occupying the modern nations of Peru, Bolivia, Chile, Argentina, Ecuador, and Colombia, the Inca Empire (1438-1532) used llamas and llama imagery to unite their territory through trade and shared socially significant iconography. Our collection of Inca visual arts features several examples of llamas. These reddish-orange llamas were originally found in a Late Horizon (1400-1532) ceremonial cache on the southern coast of modern-day Peru with a variety of northern coast Chimú and southern coast Ica style feather and metalwork objects. Containing a mixture of elite items related to Chimú and Inca cultures, this bundle represents the fusion of cultures through Inca imperial expansion and trade. Carved from the shell of a thorny oyster, or Spondylus, a mollusk imported from the tropical marine waters off Ecuador, these llama figures likely possessed multiple layers of social significance among the populations who created them. Visually, they represent the beasts of burden that enabled the extensive trade networks necessary to transport raw materials from locations that were several hundred miles away. As the inclusion of carved Spondylus shell figures in ceremonial bundles was specifically an Inca practice, these llamas may also represent South Coast groups incorporating certain aspects of Inca identity or religion into their own system of belief. Carved from a green and black stone, this ceremonial llama effigy, or illa, was used to promote agricultural and pastoral fertility in Inca communities. Inca religious leaders likely inserted a mixture of llama fat, blood, and other ceremonial objects into the hole located at the top of this vessel during various fertility rituals throughout the year. Several Inca-related groups concluded these fertility rituals by placing the illa in a pasture. Modern-day highland communities in the Andes continue to use illa during their fertility rituals to ensure the prosperity of their camelid herds. June 24 marks one of the most notable festivals of the Inca Empire, Inti Raymi or Sun Celebration. In Quechua, the native language of the Inca, Inti means sun and Raymi means celebration, and this annual observance celebrates the Sun god, the most honored deity in the Inca religion. The largest Inti Raymi festival takes place in Cusco, Peru, but luckily you don’t have to hop on a plane to take part in the celebration–look no further than the DMA! 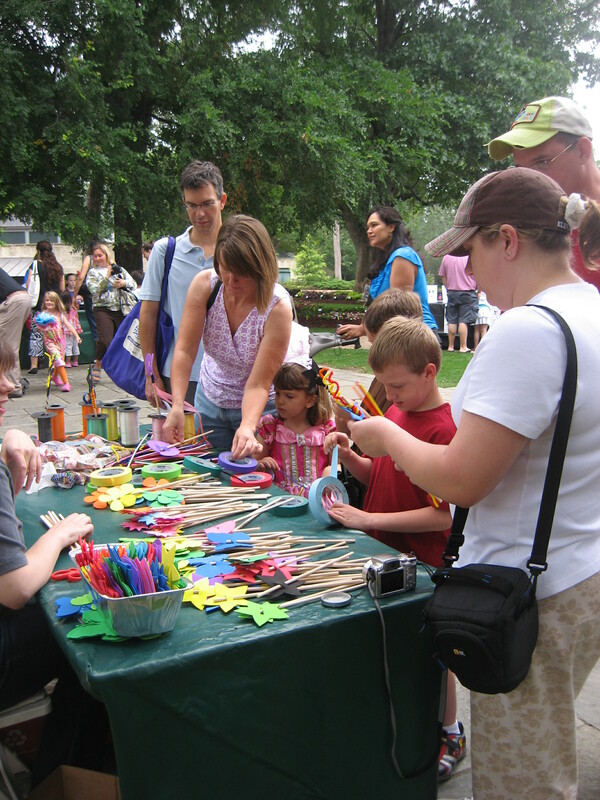 From June 24th-28th, we will be hosting sun-inspired activities and programs throughout the Museum. We invite you to participate in docent-led tours of our newest exhibition, Inca:Conquests of the Andes, investigate Inca weaving techniques through an artist-led gallery talk, or even harness the power of the sun to create your own nature print! You can craft your own sun celebration by checking out our full list of activities, here. Pierre Bonnard often used his nieces and nephews as models for his paintings. 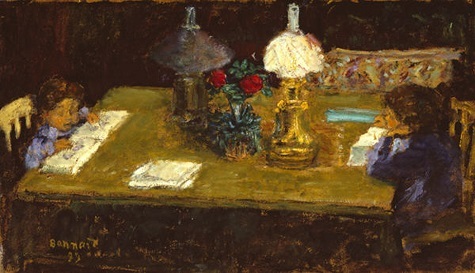 Bonnard was also fascinated by education, and in this painting he shows his nephews Charles and Jean Terrasse reading at a table. It’s easy to imagine that these two children are completing their homework assignments before going to bed. It certainly looks as if one of the boys is more interested in his reading than the other—a scene that is probably familiar to many parents and teachers. 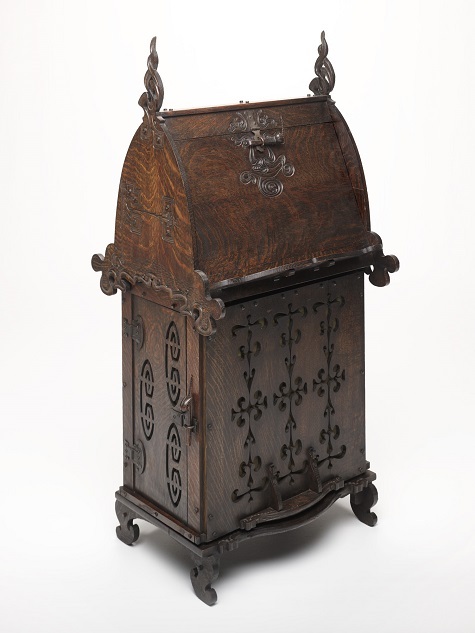 Charles Rohlfs’ Swinging Writing Desk was one of the trademarks of his artistic furniture style. The desk rests on a footed platform and spins on a series of small wheels. The interior of the desk is divided into small compartments—perfect for storing pencils, pens, and any other supplies you might need. I don’t think I would mind doing homework if I had such a beautiful desk to use. The name khipu comes from a Quechua word meaning “knot,” a fitting name as khipu are made up of many strands of knotted fibers. It is not known what the knots signify, but it is thought that they represent a numerical record. 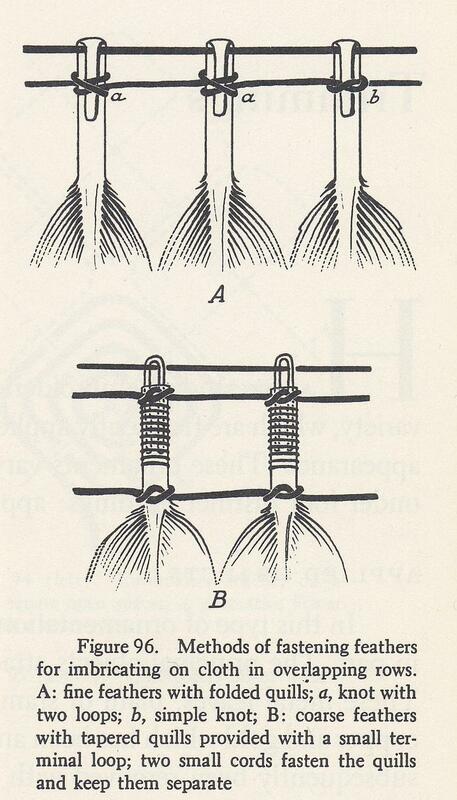 Numbers may be indicated by the size and position of each knot on its cord. September 16 is the official start date for student programs at the DMA, but we’re currently taking reservations for Museum visits and Go van Gogh outreach programs. Scheduling information can be found online. If you are an educator, we hope you’ll consider bringing your students to the Museum this year. I hope they’ll be as excited as this student was to visit the DMA! 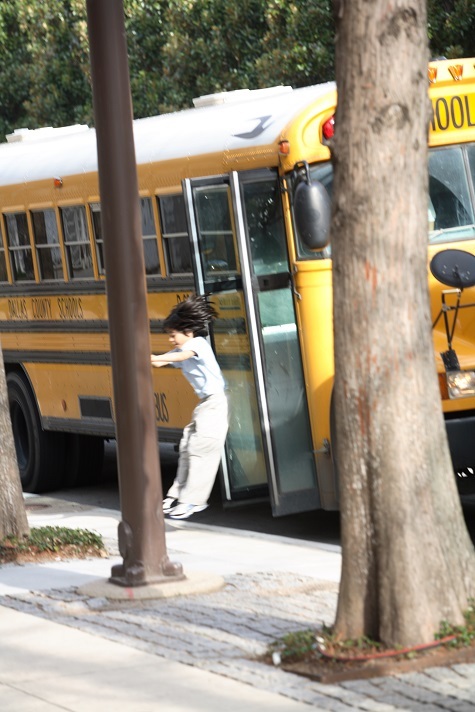 Student jumping off of a school bus at the DMA. Shannon Karol is Manager of Docent and Teacher Programs at the DMA. Where in the world can you see a llama wandering around ancient ruins, take a boat across the largest lake in South America, and eat cuy (guinea pig) for dinner? Peru! Waiting at DFW airport, ready to start the adventure! I recently took a trip to Peru to hike the Inca Trail to Machu Picchu. It was my first visit to South America, and since the Museum’s family mascot Arturo is from Peru, I thought it might be nice to take him along with me so that he could visit his homeland. He wasn’t very good at giving me directions, but we still had a good time. Our first stop was Lake Titicaca—the largest lake in South America and the highest navigable lake in the world. Arturo didn’t have any troubles at all, but when I first arrived, Peru literally took my breath away. Lake Titicaca is 12,507 feet above sea level, while Dallas is only 430 feet above sea level—that’s a big difference! Hiking around the island of Taquile, we could see all the way to the mountains of Bolivia. Next stop: Cusco and the Sacred Valley. The Inca people built Cusco as the capital of their empire and created the city in the shape of a puma. Today Cusco is a mix of Inca ruins wedged between Spanish Colonial churches, cobblestoned streets, trendy restaurants, and llamas, llamas everywhere! My favorite part of Cusco was the food. We went to the market and discovered a fruit call lucuma. It tastes like butterscotch and caramel! There are many archeological sites around Cusco, and one of Arturo’s favorites was Moray. There we discovered these huge circles dug into the ground. We aren’t sure what these were made for, but scholars guess that they might have been used for experimenting with growing different crops. Can you find Arturo? Finally, it was time to hike the Inca Trail—which was definitely the highlight of the trip. We hiked a total of 38 kilometers (about 23 miles) over the course of four days to reach the ancient city of Machu Picchu. On day two, we went over the highest point of the trek—a mountain pass called Dead Woman’s pass at an elevation of 13,829 feet. Arturo got a free ride in my backpack, so it was no trouble for him, but I was definitely sore after going up and down more than 5,000 Inca steps. On day three, we had incredible views of the mountains and started hiking through the cloud forest. We finally reached Machu Picchu on the last day just as the sun came over the mountains, and it was breathtaking. These ruins were discovered by the outside world in 1911 when Hiram Bingham, a professor from Yale University, was guided to the site by local farmers. Most scholars believe that Machu Picchu was built as an estate for the Incan emperor, but our trail guide thinks that perhaps it served as a university of sorts. Regardless of its ancient use, we were very excited to get there and were in awe of what the Inca people built. I think everyone should jump at the chance to visit Peru, but if a visit there is not in your near future, come to the DMA and take a look at our collection of Ancient American art–You’ll just have to imagine the mountains and llamas! Sican culture, Ceremonial mask, A.D. 900-1100, Dallas Museum of Art, The Eugene and Margaret McDermott Art Fund, Inc. There is something in human nature that makes people want to show off. Whether it is a new pair of shoes, a nice watch, or a brand new car, we all enjoy the “oohs” and “ahhs” that stylish objects can provoke–and it has been that way for thousands of years. Ancient Peruvian cultures, for example, loved many exotic things, especially the flashy feathers of tropical birds. The collection of the Dallas Museum of Art contains fine examples of the ancient Peruvians’ fascination with birds and their plumage. Hundreds of tropical bird species live in the Amazon rainforest, miles away from the Peruvian coast. It took quite a bit of effort (and riches) to obtain these birds from so far away; therefore, they were considered extremely valuable. Feathers were used as decoration in the form of headdresses, designed collages, and pictorial mosaics. In this Huari piece, currently on view in Face to Face: International Art at the DMA, blue and yellow feathers are used to create a brilliant geometric composition. The Blue and Yellow Macaw, typically found in Panama and the northern part of South America, was probably the source of the materials, which were used over a thousand years ago. The feathers were individually wrapped in a cotton cord and then attached to a cloth panel, making this a very labor intensive composition. 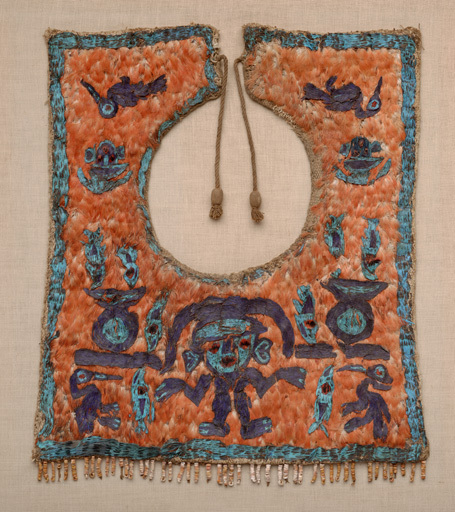 This piece was likely found along Peru’s south coast, in a site with many other textiles and feather pieces stored inside large, decorated ceramic jars. A featherwork like this was probably some kind of religious offering. A demonstration of feather weaving from "Textiles of Ancient Peru and Their Techniques," Raoul d’Harcourt, 1962. This brilliantly colored feather neckpiece comes from the Chimú culture, on Peru’s north coast. The meaning of the design is unclear, but there is a human figure with a large headdress, along with fish and sea birds known as cormorants. At the bottom are rows of beads made from spondylus shell, which comes from Ecuador. The bright turquoise feathers in this work probably came from the Spangled Cotinga or the Paradise Tanager, both of which are relatively small birds with vibrant plumage. The darker blue-purple details do not seem to be woven like the other feathers; it is possible that they are from a bird called the Purple Honeycreeper, which is found in several South American locations, but not on the Peruvian coast. 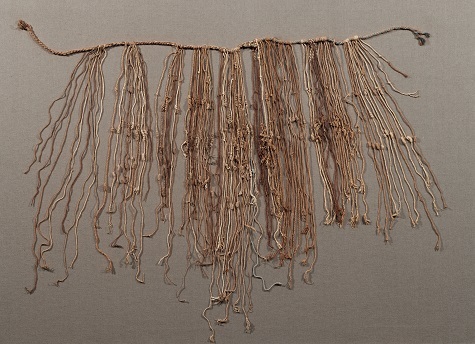 This piece showcases materials collected hundreds of miles away from the Chimú area, which is an indication of the power and prestige of the owner of this piece, as well as the intricate trading system that was likely in place. The DMA’s very own mascot, Arturo, provides yet another great example (although slightly less colorful) of just how much ancient American cultures treasured non-native birds. 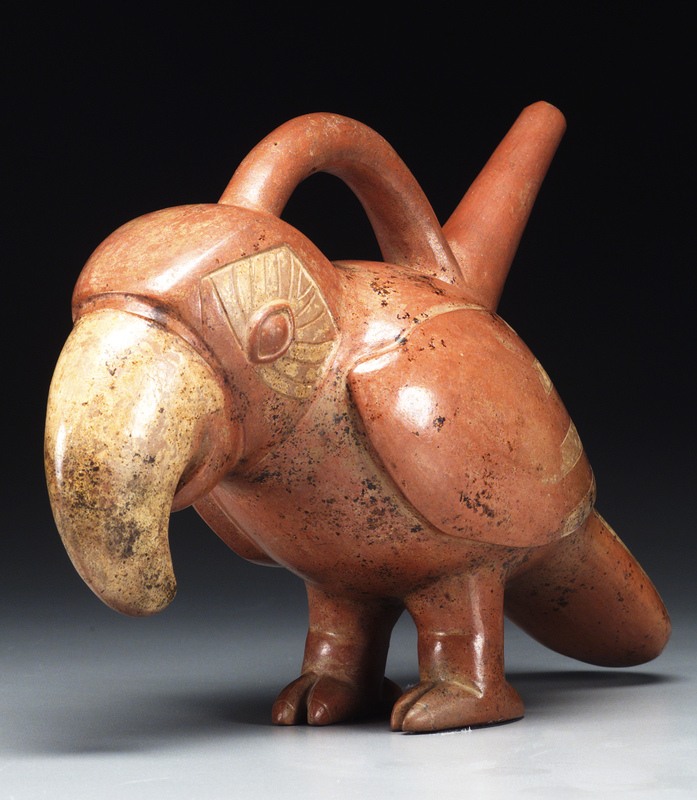 This macaw or parrot vessel was made by the Salinar, a very early culture from Peru’s north coast. Real macaws and parrots are of course brilliantly colored, but ceramics from the north coast were traditionally painted using only red and white, no matter what their subject. Macaws weren’t the only animals that were depicted in vessel form. Ceramics showing monkeys, jaguars, and even killer whales have been found at sites throughout Peru. 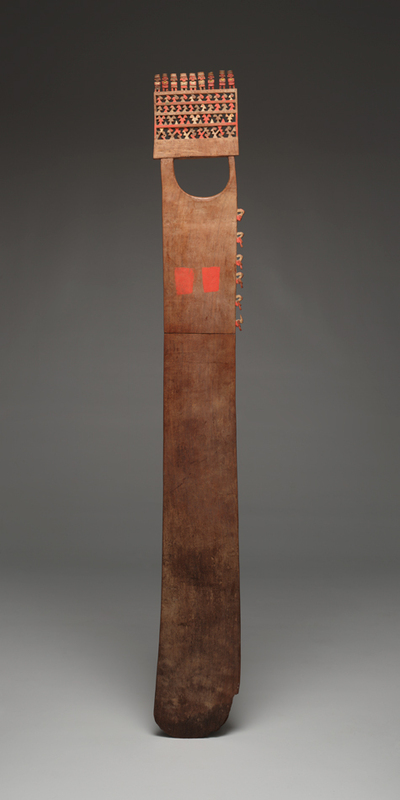 This wooden object, which has been at the DMA since 1975, was misinterpreted as a “ceremonial digging board.” Walking through the galleries of Peruvian art, I was struck by the large size and stark, seemingly utilitarian design of this object and was encouraged to research it. The figures are beautifully painted and remarkably well preserved. At the very top stand nine small, enigmatic figures. Underneath those are four rows of geometric designs, while six small water birds line the side. But other than the carvings at the top, it is a plain board. Because most “art objects” of the Americas are often practical as well, I wondered what functions this could have had. Investigations into similar objects of this type yielded an interesting new interpretation. We now know that it is a steering centerboard, and represents a fascinating and extremely useful sailing tradition. From Lothrop, Aboriginal Navigation off the West Coast of South America. Journal of Royal Anthropological Institute Volume LXII, 1932. Boards with the exact same shape and similar carving have been found in graves of the very rich on the south coast of Peru. The associated grave goods and the fine quality of these carvings (some were even found covered with gold foil! ), indicate that these were high status objects. These boards were associated with the Ica culture of Peru, who preceded the Inca Empire and were located in the very dry desert on the south coast. 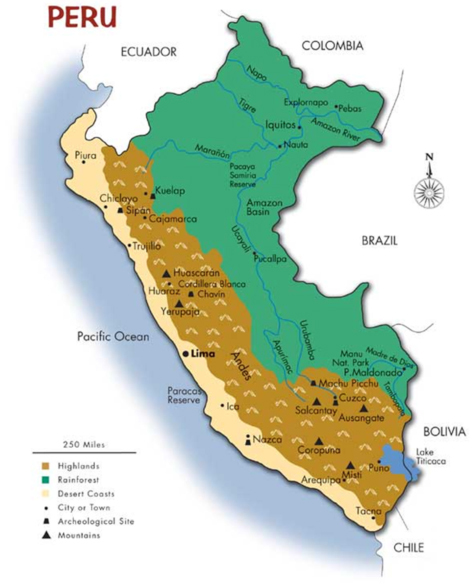 The Ica culture flourished from about 1100-1300, before being taken over by the Inca Empire. From Benzoni, History of the New World, 1546. When archaeologists started finding these wooden boards in the early 1900s, they classified them as ceremonial agricultural implements or ceremonial digging sticks. Through the research of anthropologists, we now know that this type of object had a very different function. This object is a centerboard used for navigating large balsa wood rafts on the Pacific Ocean. Though not exactly a rudder, it functions in a similar way, steering the craft. Through the interplay of sails and the movements of several of these centerboards, balsa wood rafts carrying up to twenty tons of cargo and as many as fifty people could travel all along the coast of Peru and Ecuador. We have some evidence that they traveled as far as the Pacific Islands, a distance of over four thousand miles! From Juan and Ulloa, A Voyage to South America, 1748. Anthropologists in the 1940s were interested in the maritime techniques and capabilities of the ancient Peruvians. Most objects associated with sailing did not survive, since they were made of perishable materials like wood and cotton. The wooden paddles and centerboards (like ours) do survive, because they were purposefully buried in the graves of high-status people. The dry desert conditions on the south coast of Peru allowed them to remain intact, and archaeologists started finding them in the early 20th century. 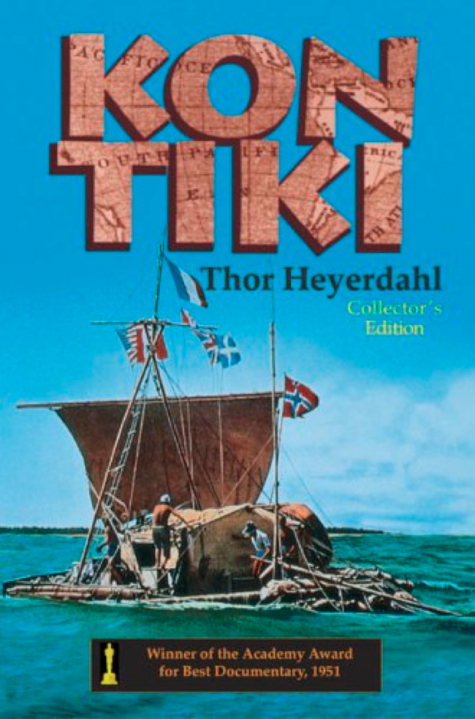 One important scholar, Thor Heyerdahl, spent years researching Peruvian navigation and sailing. He actually built a balsa log raft modeled on ancient vessels, and named it Kon-Tiki. 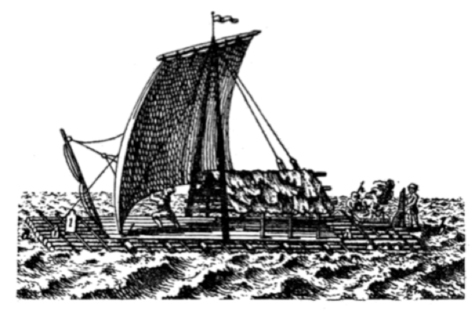 Heyerdahl and five companions tested the sea-worthiness of their vessel and several of their other theories on trans-Pacific contact between native peoples. They sailed for 101 days over 4,300 miles across the Pacific Ocean, ending August 7, 1947. A documentary called Kon-Tiki detailing their voyage—with all its challenges and successes—was made in 1950. It went on to win the Academy Award for Best Documentary in 1951 and is being remade in Norway to be released in 2012. Some of the rafts seen by the earliest Europeans off the Andean coast carried merchants and tons of cargo on board. Others were used for army transportation and the conquest and control of warlike islanders off the empire coast. 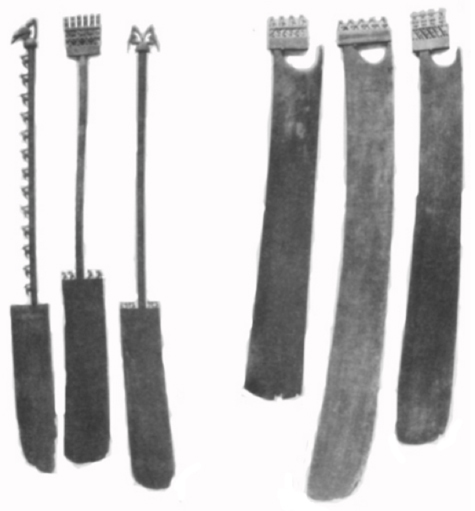 Still others were used by fishermen who went on extensive expeditions. The Spaniards even recorded Inca memories of individual merchant rafts and large, organized raft flotillas that set out on exploring expeditions to remote islands. 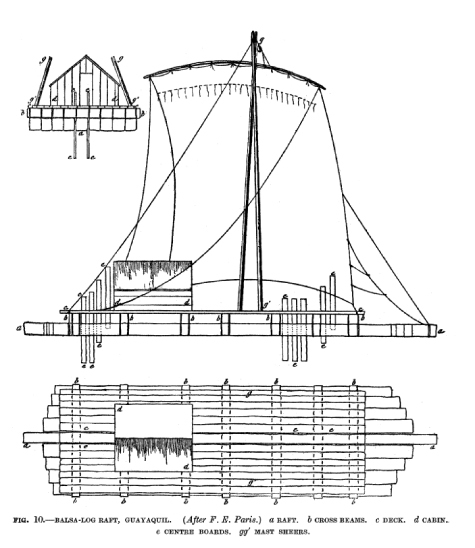 Diagram of a large Balsa-Log Raft. From Lothrop, Aboriginal Navigation off the West Coast of South America. Journal of Royal Anthropological Institute Volume LXII, 1932. Raftsmen in north Peru were great mariners who played fatal tricks on Spaniards who voyaged as passengers on their balsa rafts. 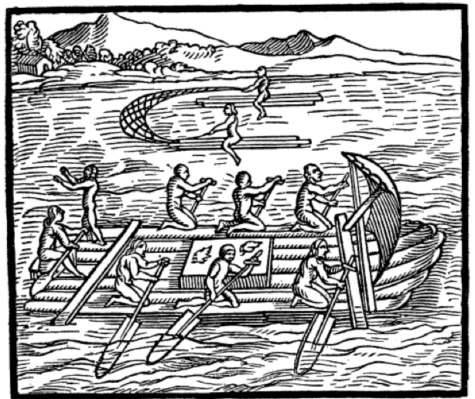 The natives simply detached the ropes holding the log raft together, and the Spaniards fell through and drowned while the sailors survived because they were outstanding swimmers. Other early chroniclers state that even before the arrival of the Spaniards the coastal Peruvians, who “swam as well as fishes,” lured the highland Incas into the open ocean on balsa rafts, only to undo the lashings of the logs and drown their less sea-minded passengers. Wendy Earle is the McDermott Graduate Curatorial Intern for Arts of the Americas and the Pacific. Hi! I’m Arturo, the family mascot at the Dallas Museum of Art. Have we met? I’m a bright, colorful Peruvian bird and I am based off a ceramic vessel in the DMA’s collection from Peru that is over 1,000 years old! I’m planning on heading to the next Kids Club event and thought I would tell you all about my soon-to-be adventure. 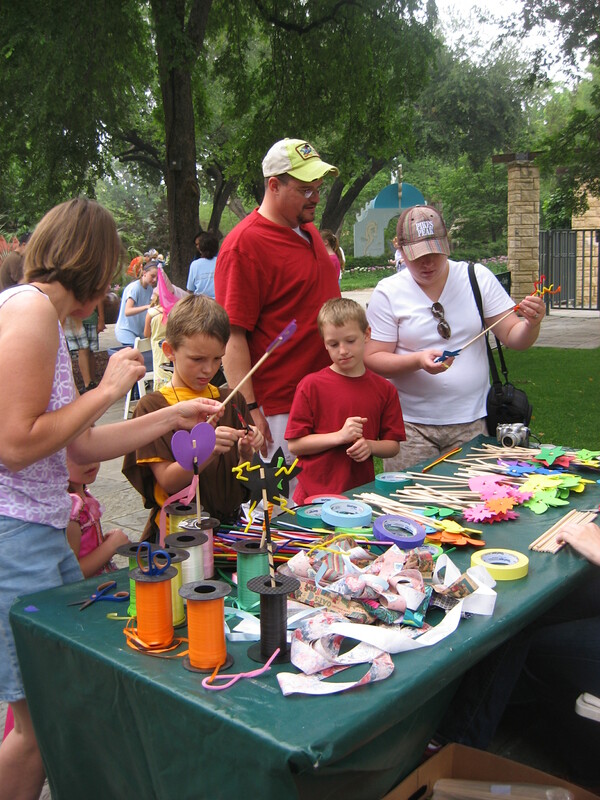 The next Kids Club event is on July 23 at the Museum of Nature and Science, and it’s the perfect Dallas event for kids just like you! Before, I tell you about my plans for my visit, maybe I should explain Kids Club. Kids Club is a group you can join at the Sustainer level membership. We partner with the Dallas Zoo, the Museum of Nature and Science, the Trinity River Audubon Center, the Dallas Arboretum, and the Crow Collection of Asian Art. Each organization hosts an event each year. That means I fly to five off-site events and then I host one at home, here at the DMA. If I miss the event, I can still go to the Zoo or Arboretum and use my membership discount. As a bird, I don’t have much room for pocket money, so I like to save when I can! The adventure will start with a brainstorming meeting with the DMA’s education staff. They help me with my activity. Like all the other organizations, I have to take a fun, crafty activity that will appeal to all ages. Last time, I took wands on my fairytale adventure to the Dallas Arboretum. They were really popular. I think moms and dads like to decorate as much as kids! Once I get my materials and learn how to make the activity with my wings, I’m ready to go! I’ll get to the Museum of Nature and Science about 8:30 a.m. so I can set up for a 9:00 a.m. opening. Then, for the next two hours, I help kids make something special to take home. By 11:00 a.m. I’m exhausted. I then have to find bird food (I like sunflower seeds) and then I’ll need a nap in Arturo’s Nest in C3! 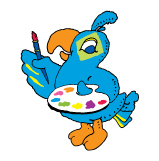 Arturo is the mascot for all Museum family programming. He makes appearances on First Tuesdays and Late Nights; you can also find him on all family related print materials and temporary tattoos. He had a bit of help with this post from Wendi Kavanaugh, Member Outreach Manager.